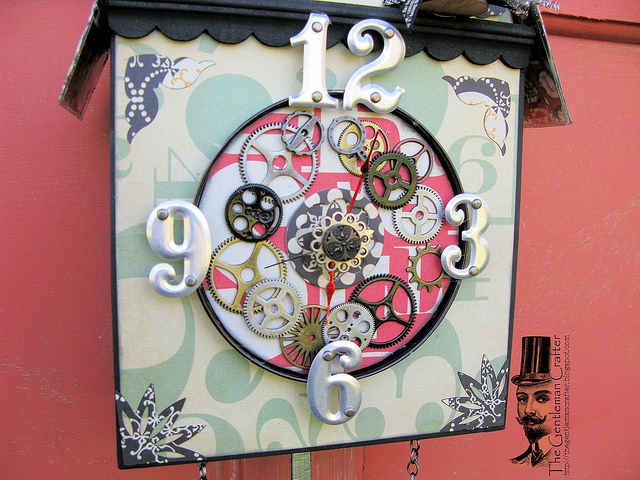 The Gentleman Crafter: The Birdhouse Clock- Done! You may recall that I started this birdhouse clock on one of my Secret Sunday Ustream shows and never had a chance to finish it. I purchased a clock that was very similar in shape and wanted to see if I could put my spin on it in chipboard....Well, with having the day off today, I tackled the project and got it done. I cannot think of a time I had so much fun making a project! It was so much fun!! As you can tell, I pulled out all my boxes of embellishments. From Tim Holtz Pulley Wheel to Graphic 45's Drawer Pull...to Prima's gears and Industrial Chic metals to the Martha Stewart paper mache pinecones! LOL! I pulled from a little bit of everything! Just had a blast! Thanks for looking! Have an awesome day! Brilliant. Is the black trim made from chipboard too? Beautiful! Love all the gears and your framing around the bird hole. Oh poo, now I have to go to the craft store to buy those Martha cones that have been on clearance for months. Love the feminine touch to this. It turned out beautiful. amazing!!! this is gorgeous Jim...would have luv'd to watch you make it!!!! I love, Love, LOVE IT!!!! Wow! WOW!!!!!! Wowsers! It it so cool looking.... can you tell i like it? WOW...three posts in one day!! Yes...it was 3...but only 2 with projects. You certainly have been a busy, busy boy, my friend. 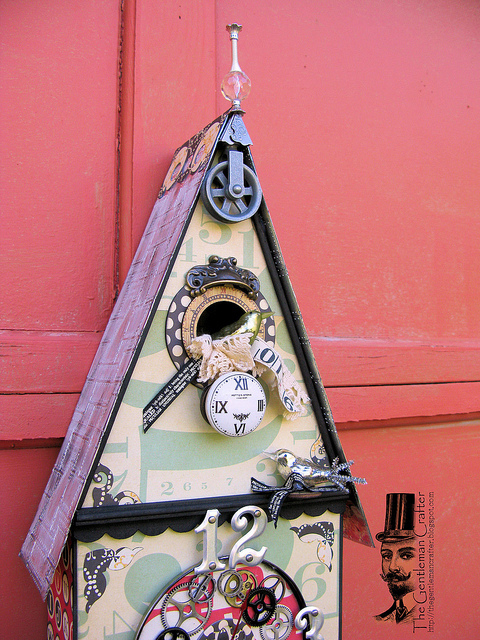 I love how you've finished your birdhouse clock! I would love for you to do a YouTube tour of the clock...just a quick on so we can see all sides. So...what are you going to surprise us with tomorrow??? Can't wait to see. Oh what fun! You have brought all the bits and pieces together beautifully. Love the clock face. Thanks for sharing. Jim, your clock is Fabulous!!!! I love the lace and tape measure coming out of the nest and all the gears. Your pendulums put mine to shame. Great job! Wow! It's fabulous! I love it! What is not to like about this beautiful, stunning piece of art work by Jim, The Gentleman Crafter. Love it Jim! 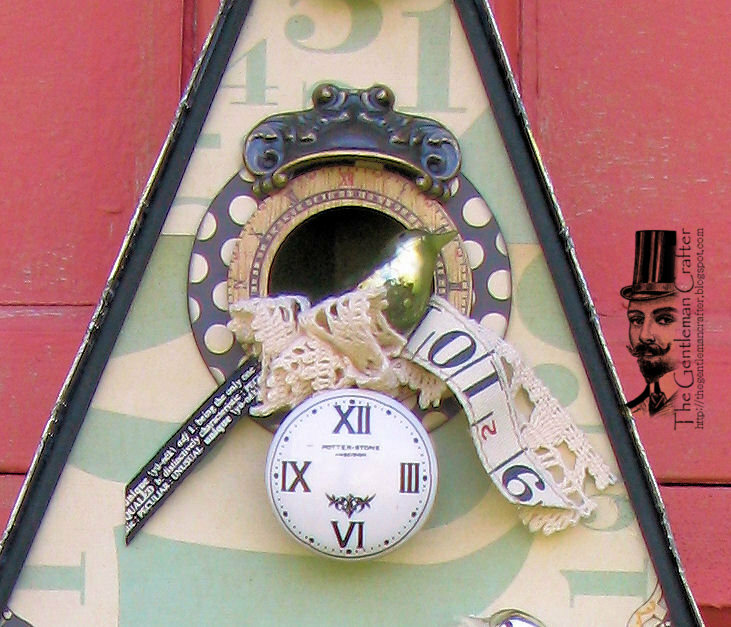 What a brilliant cuckoo clock! You are a genius when you work your magic with those metal embellishments! So glad that you are having fun on your vacation. Beautiful! Everytme I look at it I see something new and interesting that I didn't see before. What a feast for the eyes. I would love a pattern for this one! Oooooooh i love your clock, he's awesome. Wow! What a fantastic clock. You have certainly pulled out all your stash to make this such an interesting piece. I loved the tag from your earlier post as well. Great imagintation! Gosh, the whimsy factor is incredibly high on this gorgeous project. I love the colors you chose to work with...so nontraditional and totally fun. The fact that you even included the pinecones on the bottom blows me away. Amazing! just love this clock....sooooooo wonderful! i'm so sorry I missed the secret sunday...would love to make one...can you make a tutorial?????? Pretty cool Jim. Love how it all came together. thanks as always for sharing. Oh... my... gosh.... I LOVE, LOVE, LOVE this!!!!!!! Did I say I love it???!!! It is pure genius!!! What I wouldn't do to get inside your imaginative mind!!!!! Fabulous!!!! Did I mention that I really, really love it??? Hugs to you!!!! Thanks for sharing!!! Fabulous!! You never cease to amaze me! So, what is that glass thingy at the top? Looks like a light bulb with a chess piece glued on! Oh My this turned out wonderful! I love everything about it! I guess you went on a treasure hunt in your stuff to find all of those fabulous pieces! You Rock!!! Fabulous!!! is this great....??!! YESSSS it is!